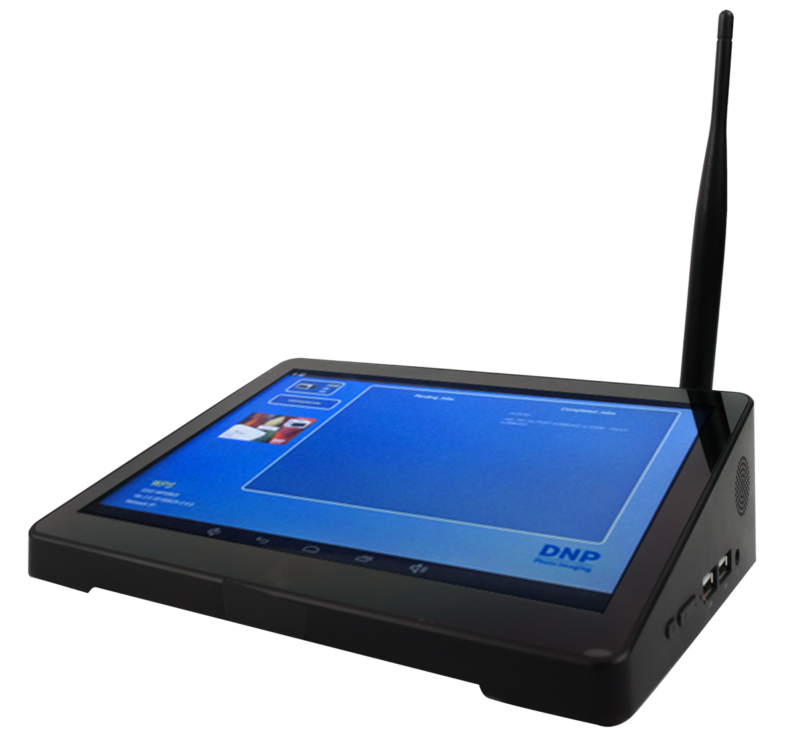 CONCORD, North Carolina – DNP Imagingcomm America Corporation (DNP IAM) today introduced the new WPS™ Pro Wireless Print Server. Designed exclusively for DNP’s award-winning DS40™, DS80™, DS620A™, DS-RX1HS™ and DS820A™ dye-sublimation printers, the WPS Pro allows photographers to print directly from Wi-Fi enabled capture devices without the need for cables, memory cards, or an internet connection. The WPS Pro is ideal for event and wedding photographers that require on-demand wireless printing workflows. WPS Pro allows event photographers to roam, capture and wirelessly print candid shots taken at the company picnic, local pet store, or sporting event; and perfect for the wedding photographer to capture and print the memories of the rehearsal dinner, wedding reception, and that special Father-Daughter dance. The WPS Pro features an easy-to-read 7” touchscreen display that allows users to easily monitor print jobs, printer status, and see remaining print counts. The touchscreen also makes it easy to configure changes including language, default print queues, and applying borders. Using its built-in 802.11 b/g/n Wi-Fi access point, the WPS Pro allows users to print from Wi-Fi enabled DSLR cameras, mobile devices (including phones and tablets), as well as Windows or Mac computers, all without the need for an Internet connection. WPS Pro supports up to five simultaneous wireless device connections. With its own network access point, no router is required to print via the WPS Pro allowing for increased flexibility in workflow, set design, and hardware arrangement. A single WPS Pro can connect with two DNP photo printer models for speed/redundancy or for an increased range of print size options. The device allows for multiple print sizes including 2×6” photo strips, 5×5” and 6×6” square prints as well as traditional 4×6”, 5×7”, 6×8”, 8×10” and panoramic, depending on the printer combination and media. It also supports printing with glossy and matte; and can be configured to combine images with custom borders. *Fine matte printing only available on the DS820A. DNP Imagingcomm America Corporation has the broadest selection of solutions for the photo retail market and products designed to address retailer’s specific business goals and objectives—backed by the quality and reliability today’s customers expect. Manufacturing, sales and development offices of dye-sublimation media for photo printers is located in Concord, NC, and more information is available at www.dnpphoto.com. DNP, founded in 1876, is the world’s largest diversified printing/coating technologies company. At its 70 production plants, both in Japan and overseas, DNP’s operations include commercial printing, packaging, decorative materials, electronics, business forms, and imaging products. Over 25 years ago, DNP was one of the earliest organizations to pioneer dye-sublimation media—and the first company to start business development in thermal transfer ribbons. DNP has since grown to be the world’s largest manufacturer of dye-sublimation media and thermal transfer ribbons. For more information, please visit www.dnp.co.jp/eng.